Aaram Mahal, Udaipur is unique among luxury hotels in Udaipur. With the flamboyant City Palace, Udaipur as the backdrop , Aaram Mahal , Udaipur provides a panoramic view of the old city and its surroundings . Overlooking City palace , several historic monuments like the Jagdish temple , Sheetla mata , samor bagh , old city market are all in the vicinity of the Mahal. 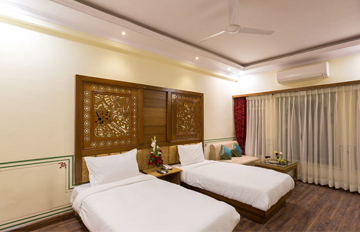 Aaram Mahal , Udaipur stands amidst the exotic location offering the view of City palace on the north east side and the Samor Bagh on the south west side. The majestic City palace is the most visited tourist attraction of Udaipur and stands in front of Aaram Mahal. Situated in the premises of City palace , Jagdist temple is the biggest and the most beautiful temple in Udaipur . Sahelyon ki bari , a polpular garden is located 3.5kms from Aaram mahal , Udaipur . The Gulab Bagh and zoo is the largest garden in Udaipur and is 2 mins walk from Aaram mahal. The heritage walk in Udaipur is also a popular tourist attraction as it takes visitors through many historic locations providing plenty of knowledge about culture and traditions of Mewar. Aaram Mahal , Udaipur offers the guests with ample covered parking space making it easy and convenient for the guests visiting old city. Aaram Mahal, Udaipur offers splendid view of the City Palace from the Mahal rooms providing a royal experience in Udaipur. Aaram mahal is a masterpiece of architectural marvel designed on the Mewar architectural style , providing panoramic view of the city from its Mahal rooms and exotic city palace view from the roof top . The Aaram mahal , Udaipur standing in the beautiful old city of lakes in India which is the land of opulence , kingdom of maharajas and a glamorous landscape is based on the ancient theme of Aaram Mahal signifying the " stopping place for Maharajas and the royal families, Abode". Rulers in INDIA in the ancient times would built forts and building within the forts which would be designated as "MAHAL" or a "PALACE". It was considered as a summer house, private lodgings of pre-independent India. All royal rulers have built many mahals in India. Aaram mahal with this unique concept has opened its doors for the travellers and tourists to take the guests into the royal era , also highlighting the story and history associated with the different musical instruments with its theme based Mahal rooms. 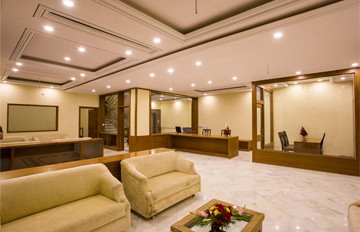 Pachar Group with its second theme based hotel in Udaipur and third in Rajasthan offers the guests 37 Mahal rooms highlighting the history associated with different musical instruments ranging from Veena, flute, harmonium and many more. 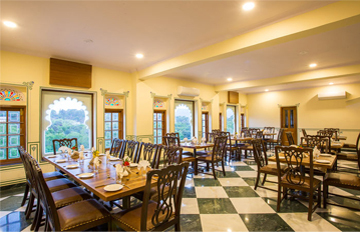 All 37 mahal rooms are designed in a broad style and shape conveying and highlighting the history and importance associated with different unique musical instruments like sarod , sitar , manjeera , etc. Whether its a wedding celebration or an anniversary or any other ceremony we offer you with majestic experience for any occassion close to your heart. A plunge of relaxation in your leisure times for rejuvenating your mind and body releasing all stress out.We bestow you with our exotic spa for extended cleansing of skin. Indulged in mesmerizing aura and exquisitely designed multi-cuisine fine dine restaurant having an essence of traditional designs and interiors atmosphere.